The kitchen design and kitchen remodeling follow the new fashion: Tuxedo Kitchen. 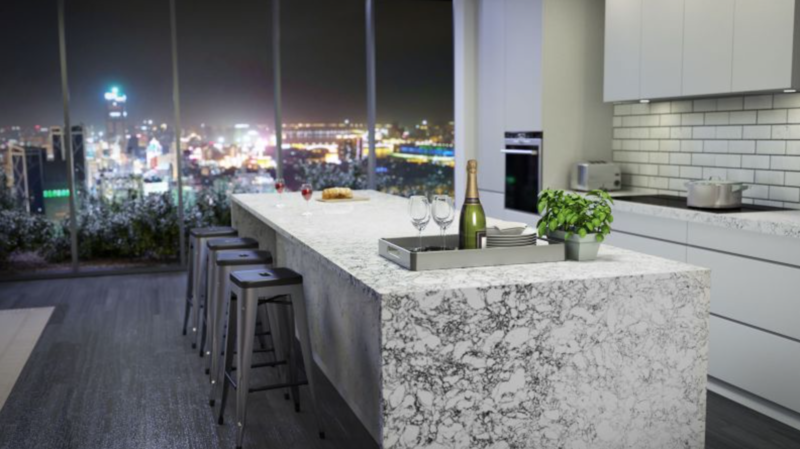 Tuxedo Kitchen is actually a combination of past and future where black and white marble look countertops meet either white kitchen cabinets or dark kitchen cabinets.It is well known that marble has an eternal power as a look. However, marble countertops are not durable and functional if they are compared with Engineered Stone. In kitchen remodeling marble countertop and cabinets are the main elements. Cambria Rosedale-Cambria Rose Bay Marble Look Countertops which are the kindred souls for tuxedo kitchen remodeling or design. Cambria Rosedale-Cambria Rose Bay Marble Look Countertops have almost same pattern. The only difference is the size of their curvy veins while the sandy spreads keep the steady motion. A visual comparison shows that, big sister Cambria Rosedale Quartz Countertop has large bold veins while little sister Cambria Rose Bay Quartz Countertop has tiny homogenous veins. In the first sight , vein colors give the black effect but actually not. Three tone of dark gray are dominant. By using the Pantone chart, I can call those grays Vulcan, Salute, and Moonless Night respectively. It is not easy to find the similar looking natural stone and every natural stone has unique look. Morever, if the veins are in flow I can recommend White Carrara Marble, Statuarietto Marble or Statuary Marble for your tuxedo kitchen design as a replacement. Cambria Rosedale-Cambria Rose Bay Marble Look Countertops go very easy with white cabinets, dark cabinets and gray cabinets. Considering backsplash or flooring , neutral colors or even tuxedo are being proper additions. The ambiance would be better, by mentioning Cambria Rosedale honed finish and Cambria Rose Bay honed finish countertop. Another option is the two tone cabinets where contrast creates the sharp image in your kitchen. I personally think that the cabinet colors, which have two useful hints for two tone cabinets kitchen design ideas, are important: First, wall and base cabinets are white against a black island base is a good option. Second,white kitchen wall cabinets against black kitchen base cabinets sounds doable. When the countertop colors count, two tone countertops kitchen design ideas would be great addition to your kitchen. Since the countertop goes for plain black, island top would be marble look engineered stone. With a big thank to Marva Marble, I have one Cambria Rosebay Countertop picture. However, sharing some inspirational pictures to give almost the same visual taste by using White Carrara Marble Countertop Pictures. As long as I will reach out the Cambria Rosedale-Cambria Rose Bay Marble Look Countertops in Pictures , my page would be updated for your review. Picture Credit: Marva Marble . 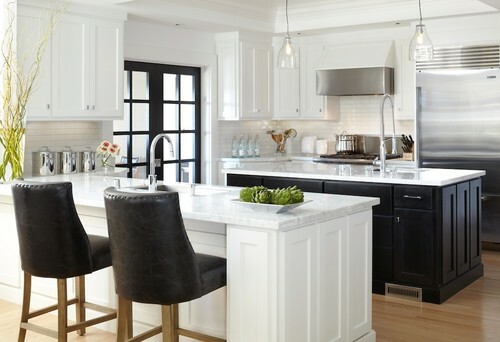 Black and white, tuxedo style kitchen design where Cambria Rosedale Countertop meets, seems eternal. Water fall edge Cambria Rosedale island top is a big bonus. Black effect are visible by adding black subway tile grout to white ceramic subway tile, choosing black kitchen appliances and black top kitchen stools. Very inspirational. Picture Credit: Urritia Design. While giving a tuxedo kitchen design taste, please consider black framed French Door, black breakfast chair, and black island base. I think this is a helpful example to replace White Carrara Marble with Cambria Rose Bay countertop and Cambria Rose Bay island top. On the other hand, very good sample of two tone kitchen cabinet ideas. Picking natural color kitchen hardwood flooring gives a warm looking to tuxedo kitchen. Keen eyes and excellent coordination needs a big applause. Photograph by Casey Dunn. Design: Austin Architects. For my opinion this picture is one of the best candidate to show the tuxedo design with two tone countertops. 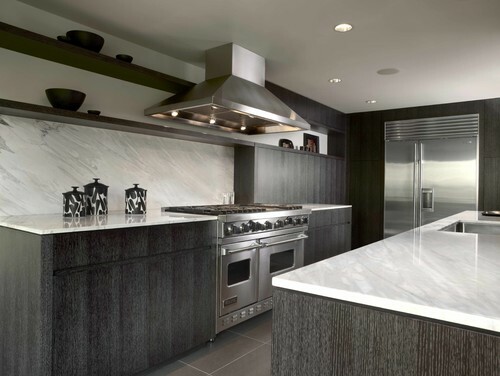 First ,picking the honed absolute black granite countertop and honed white carrara marble island top are like the jewel in this contemporary kitchen. Then, replacing the backsplash with Cambria Rosedale full high backsplash would be a novelty. Finally, a rare gem stands in your kitchen. Picture Credit:Kitchen Master Corp via Houzz. What if the island top would replace with Cambria Rose Bay? This is a real revolution where two tone kitchen cabinets combine with two tone countertops. Keep the tuxedo design always in the mind! Hats off job. Picture Credit: Second Nature Interiors via Houzz. Two tone cabinets and lovely carrara marble countertop and island top. When you think about black and white kitchen design, please be detail oriented like Second Nature Interiors. Even the Kitchen Pendant Lights are black and white while the carpet and chair cushions complete the puzzle. My replacement goes to Cambria Rose Bay Quartz Countertop to give a fine taste idea. Picture Credit: Warmington&North. Textured wood graphite color kitchen cabinets and simple design catches my eye when tuxedo kitchen is being fashion. Embellishing the neat design with White Carrara Marble full high backsplash and Carrara Marble Countertop would not be expressed without a meaningful touch. My idea is Cambria Rosedale-Cambria Rose Bay Marble Look Countertops are good matches while this kitchen is taken as role model.